Here's another cool new Cherry Mobile Android smartphone that TP Friend Charles Quiachon chanced upon when he walked around SM North EDSA Annex CyberZone this afternoon. 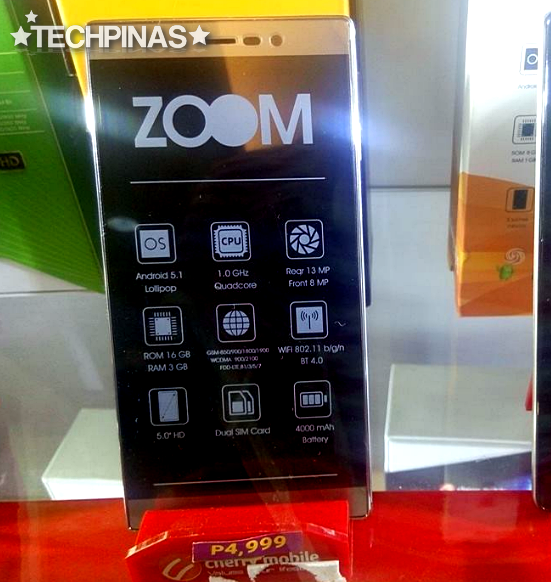 Quietly seeded to kiosks, concept stores, and authorized retail outlets a few days ago, Cherry Mobile Zoom has a handful of amazing features that make it quite a stand-out in its price category. 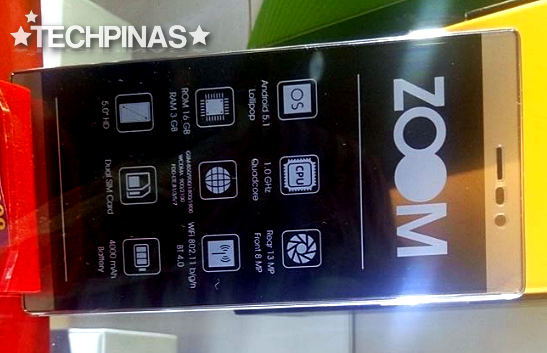 With official SRP of only Php 4,999, CM Zoom is currently the most affordable Android handset by the company that has 3GB of RAM for smooth multitasking and app transitions. And on top of that, it even has a large 4,000 mAh battery pack that should be good enough to provide up to two days of uptime with regular use and with mobile data turned on. Other key technical specifications include its 5-inch HD IPS display panel, 13 MegaPixel autofocus rear camera with LED flash, 8 MegaPixel selfie cam, Full HD video recorder, Dual SIM Dual Standby capability, and - get this - 4G LTE support. Under the hood, it runs Android 5.1 Lollipop with 1 GHz Quad Core processor (Let me get back to you on the exact chipset model) and has 16GB of expandable storage. In terms of design, it appears that this release will have a near bezel-less face, which should give it a more compact footprint. Just from looking at these photos given to us by Charles, it seems that the device also has a metallic rim giving it an air of elegance. I'm personally looking forward to giving this release a test run and seeing for myself what it has to offer. I'm interested in finding out if its name says something about its imaging capabilities; Because if it does, then I think this model is poised to be one of the best 'value for money' Android smartphones that we can get from Cherry Mobile this year.